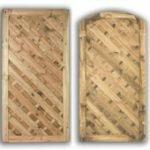 All our wooden garden gates are sold as single leaves and do not include posts, accessories or fixings unless specified. For posts, accessories or fixings please select “related products” or navigate to relevant areas of the site. Basic Overlap, Waney edge Gate. 1.8m (6ft) in height 0.9m (3ft) in width Stained in the Orangy brown to match the range of lap panels. A good middle of the range gate, ledge and braced. Benefits from being tanalised/pressure treated. Available in Tanalised Green and Tanalised Brown. 1800mm tall, 900mm wide with a flat top or arched top. Supplied as single gate only. Please visit our accessories section for a wide range of posts and ironmongery. Tongue and groove dome top gate, Fully preasure treated. Available as 1.8m high, to the centre of the dome and 90cm wide. Sold as gate only. 1.8 x 0.9 (6ft x 3ft) Ledge and brace Tongue and Groove gate Fully Tanalised Green. The Wellow uses tongue and groove match boarding with an arched top and rounded stiles which gives a nice decorative finish to the gate. 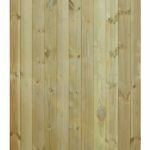 The Wellow Tall has a width of 0.9m and a height of 1.8m. The Wellow Short has a width of 0.9m and a height of 0.9m. A quality framed, ledged and multi braced morticed side gate. The Town uses tongue and grooved match boarding which offers privacy and security. Tanalised/pressure treated for extended life. Features heavy duty horizontal ribbed slats. Perfect for maintaining privacy. Available 0.9m wide and 1.8m high. Tanalised devon gate. Supplied as single gate only. Please visit our accessories section for a wide range of posts and ironmongery. Tanalised/pressure treated for extended life. Features heavy duty ribbed slats in a chevron design. Perfect for maintaining privacy. Available 0.9m wide 1.8m high. Tanalised york gate. Supplied as single gate only. Please visit our accessories section for a wide range of posts and ironmongery. Available in 0.9 m (3 ft), 1.2 m (4 ft) and 1.8 m (6 ft) heights. Available in 0.9 m (3 ft),1.2 m (4 ft) and 1.8 m (6 ft) heights. 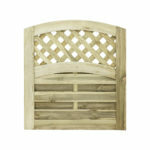 Finding the right wooden garden gate is easy when you shop with us. 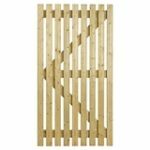 Oakdale Fencing have a wide variety of single garden gates that are suitable for use as side entrance, yard or garden path gates. 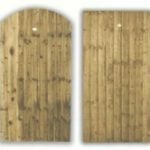 If you are looking for a low level path gate we have a range of traditional timber picket gates that start from 3ft high and can be supplied up to 6ft high. 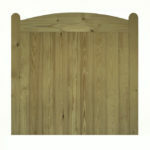 You can choose from pointed top, round top or square top palisade options. Perhaps you want a traditional feather edge garden gate gate for your yard entrance? You can shop online for our 6ft tall versions, you can either choose a fully framed gate (Country gate) or opt for our standard feather edge gate (ledge and braced). The standard version comes in as a square top option. If you want a different size standard feather edge gate we can make the Ledge and braced gates to order but you’ll have to call us with your requirements. We can not make the Framed gates to size. 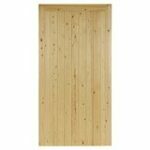 We offer a range of solid tongue and groove gates. The Wellow, The town and the ledge and braced gate in 1.8m (6ft) high and 900mm (3ft) wide. The Wellow in 900mm (3ft) high and 900mm (3ft) wide. 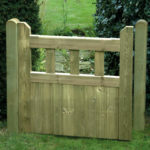 If you are after something a little more decorative you could opt for our York, Devon or St Melior wooden garden gates. The gates are both fully framed and offer a two layer cladding. York gate cladding runs diagonally whilst the Devon and St Melior cladding runs horizontally. The Devon and York are available with a Flat top, The Devon and St Melior are available with a rounded top. Our St Melior gate is our best seller. Fully framed, this gate also has a double cladding effect with boards running horizontally. What sets this garden gate apart is the arch top trellis fixture which adds a nice decorative touch to the gate. 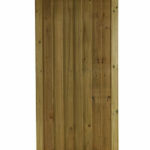 All our wooden garden gates are supplied without posts and fittings. 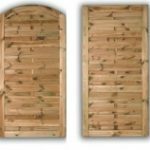 We have a wide range of styles of furniture and sizes of posts that can be sourced from our gate post section and gate furniture section. Be careful with measurements, all our gates come in standard 0.9m width, so check your entry gap first. If you need a special size we may be able to help on picket, feather edge or tongue and groove gates. Call us to discuss options.